A mainly sunny sky. High 73F. 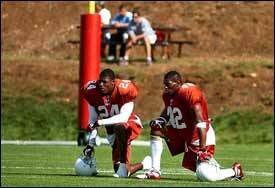 Winds SSE at 10 to 15 mph..
Greg Bryan/Arizona Daily SunArizona Cardinals safeties Adrian Wilson (24) and Kwamie Lassiter (42) take a breather during afternoon practice at training camp Thursday. Greg Bryan/Arizona Daily SunArizona Cardinals safeties Kwamie Lassiter (42) and Adrian Wilson (24) head upfield during afternoon practice at training camp Thursday. 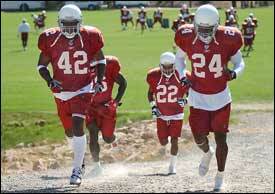 The word that has been often associated with Cardinals second-year safety Adrian Wilson is playmaker. And at the end of last season, Wilson showed a willingness to live up to that moniker. At the 10-minute mark of the opening period of the season finale in Washington, Wilson stepped in front of Redskins receiver Michael Westbrook on a slant pattern, picked off the ball and ran it back 61 yards for a touchdown. For the Cardinals, the only real importance of the game was to decide if they would avoid another losing season in the desert. (They didn't, as Washington came from behind for a 20-17 victory. The Cards finished 7-9.) For a rookie like Wilson, the meaning of the closing games of 2001 season couldn't be understated. "I just wanted to go out in those last two games and make a statement, just to show the coaches I can play," Wilson said. "I'm quite sure they already knew I could play, but to just go in there and make a statement in those last two games was huge." Before his interception and touchdown at Washington, he had three tackles and batted down a pass against Dallas, then had a seven-tackle showing against Carolina. "He started to come along at the end of the year, and you could see him progressing," Cardinals coach Dave McGinnis said. "That carried over into the offseason. He had a marvelous offseason." Wilson, a rangy 6-foot-3, 217-pounder who was a third-round pick out of North Carolina State in 2001, will team with free safety Kwamie Lassiter this season in the secondary. And a unit that looked like it would be thin with the departure of Pat Tillman, who traded in the Cardinals' red and white for the Army's camouflage, now looks to be a strong suit of a young defense. "They've got range," McGinnis said. "They've got size and speed and they love to play. They're intent on being the best tandem in the league. And I like what I see out of them." Wilson provides athleticism and flexibility at strong safety. Lassiter has uncanny instincts for being in the right spot at the right time. Lassiter has 22 interceptions in the last four seasons, including eight in 1998 when the Cardinals last played in the postseason, and nine last season. Lassiter's importance to the secondary cannot be underestimated. He helped Tillman grow into one of the NFL's fiercest tacklers, and he intends to do the same with Wilson. "I'm like a sponge, man," Wilson said. "I just want to learn as much as I can from him." Joked Lassiter: "I haven't had to hurt him yet, so he's been doing a good job." Lassiter once had a four-interception game against San Diego in 1998. While some of the passes were tipped right to him, those bounces weren't necessarily lucky. Lassiter had a knack for being near the ball because he is so adept at studying film and reading offenses. Yes, the bounces may have been lucky, but Lassiter was in those particular spots for a reason. "It goes back to when you were playing ball when you were younger," the eighth-year pro from Kansas said. "You had to be where the football was. That's what they told you when you were younger — get to the football. It has a lot to do with film study and the coaches putting us in the right defense. They put us in the right situations to make plays." Added McGinnis: "It's instincts and it's studying. It's knowing what's going on. It's paying attention to detail in practice. It's paying attention to scouting reports. Kwamie's a student of the game. I love Kwamie Lassiter. He's exactly what I want back there running my secondary." Lassiter, in turn, loves Wilson's size and athleticism, which gives the Cardinals a measure of flexibility on defense. "Nowadays, you've got receivers just as tall as he is," Lassiter said. "I remember last year, he lined up against a receiver and made a big play in a game. We can put him up against taller receivers in the red zone, where they can't just throw fades over our smaller corners. His size brings a lot of size to the table for us." Lassiter was designated the Cardinals' franchise player in the offseason, and it is no secret that he desires a long-term deal. Negotiations quickly broke down in the offseason, but he has vowed not to let his contract situation get in the way of excelling on the football field. "In the offseason, it was a problem that didn't have to be," Lassiter said. "But during the season, I don't even think about it. I just want to win. I just want to make this team better."